For a long time I have struggled with how to correctly setup a SQL Server Database project. The main sticking point is to try to script views that use linked server connections. SQL71561: View: [dbo]. [vwTest] has an unresolved reference to object [LinkedServer].[RemoteDB].[dbo].[tblTest]. A solution that compiles even with views that run across linked server connections. The solution has Intellisense working for the linked server database. The ability to adjust the details of the linked servers when publishing the database via the SQLCMD Variables. You need a .dacpac file of your target database. Create a connection to your remote/linkedserver target database. Click finish and visual studio will create a scripted copy of your database. In my case I was trying to reference an Enterprise level database with a few thousand tables, but rather than generate the entire database I just created the 20 – 30 tables that are referenced most often and used that as my DB project. Over time as I need more and more tables I will just script and import a few tables at a time, via the Import –> Script option. Note: I also generally write a post build event and copy the .dacpac file to a central higher level folder to allow any project to reference the .dacpac file from a central location. Choose your .dacpac file that you generated in step 1. Database Location – even though the Database is on a “Different Database, Different server”, you need to set it as “Different Database, same server”. This setting allows intellisense to work. You should get full intellisense on your schema as compiled in you .dacpac file from step 1. Click “Load Variables” to load in the values set in step 4. Because of the double brace ]] issue, (which I have raise with Microsoft on Microsoft Connect ), you would be able to just click Publish. The value in the SQLCMD Variable will be replaced into the script when deployed, and your table references will become 4-Part table names with [LinkedServer].[RemoteDB].[Schema]. [Table] as the output. Please Download a working sample of the solution. Thanks for this useful post. After trying a long time to bypass the double square bracket issue with build event scripts and sqlcmd predeploy scripts i found that it suffice to replace square bracket by double quotes. In scripts replace [$(RemotDB)] by “$(RemoteDb)”. You then can benefit of Intellisense and automatic deployment. Thank you for your comment, Bulgom. It has saved me lots of time. I was wondering if you had found a solution to the problem with SQL Compare in later deployments of objects. In my project, I have the variables and values set up precisely as you have here. However, when I compare to my deployed database, all objects that refer to that SQLCMD variable show as being changed, because the comparison is comparing [$(ServerVariable)] to [ServerName].[DatabaseName]. I can’t seem to find a way to have it use those the variable values in the process of the comparison. Yes, I think I have the answer to that one. If you are performing a schema compare, the visual studio comparison tool uses the “default” SQLCMD variables as defined for the project. If you press Alt+Enter (or right click properties on the database project), Switch to the SQLCMD tab. What ever you find as the defaults on this screen is the value that the schema compare uses to look for differences. If you have a table/view/procedure that is showing up as different in the schema compare results, when you view the differences it will show the [$(ServerVariable)] as being different. If you have your SQLCMD varibles in alignment, this can be ignored as it is generally a false positive. Look in the script and you will find other things wrong. Fix the rest of the script and compare again and the script will now show as being equal. I pretty much am in the same position as you are. Thank you very much for your reply! Just to clarify and make sure you got my point. It does work. You just need to ensure that the “Default” SQLCMD values, as configured on your project match the environment you are comparing against. Hi, Can we use the same LinkServer which we use SSMS? Not sure I really understand the question? Yes, you have the use name of the linked server you have configured on your server via SQL Server management Studio… otherwise the generated code will not work. 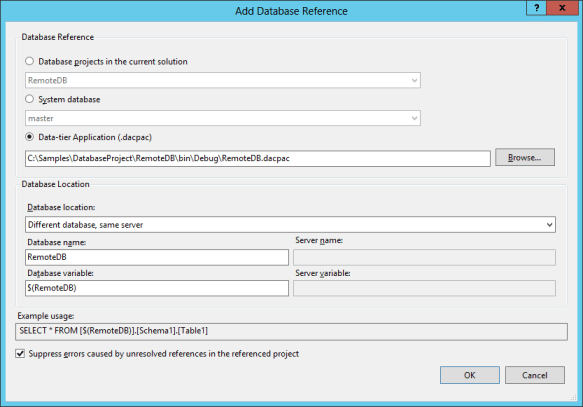 It seems variables cannot be used in a Visual Studio Database Project, such as CREATE USER. VS complains it cannot find the user account. Is it possible to have a more detailed version of Step 1?